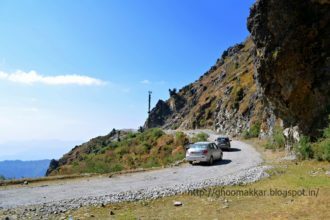 Rays of Light - Ghumakkar - Inspiring travel experiences. 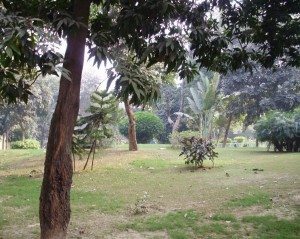 The fresh winter morning in Poorvanchal, a bright sun shining in glory, dusty paths, the soft yellow soil with seeds of plenty, green shadows of foliage, the massive tree trunks, grazing cattle and site of Budhhist monks in red and yellow ‘chivar’. It is all still the same! Several centuries back when He chose Sarnath as the place of his first sermon, his thoughts, polished and refined after years of penance and then the enlightenment, must have flown like the pure waters of Ganga and his words would have floated in the same eastern breeze. How fortunate could I be to be in the same place where Gautam Buddha, the priceless son of the soil, walked and talked. Sarnath has not changed much since those days 2500 years back. Of course the signs of modern India in terms of speeding motor vehicles, shops selling Lays and Coke, bent street lamps and tar roads full of pits is all there. But still you can sense the soul of this village is dwelling in the past like several of its counterparts throughout the country. 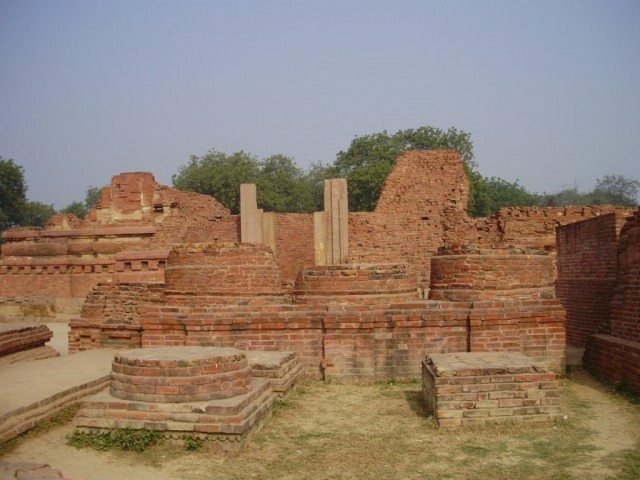 The original name of the place is ‘Issipattan’ which later changed to ‘Sarangnath’ which in turn became Sarnath. Sarang means deer and hence Sarnath is also known to be deer park, ‘Mrigavan’. The name matches perfectly to the glorious history where Budhha preached for the first time in a deer park. 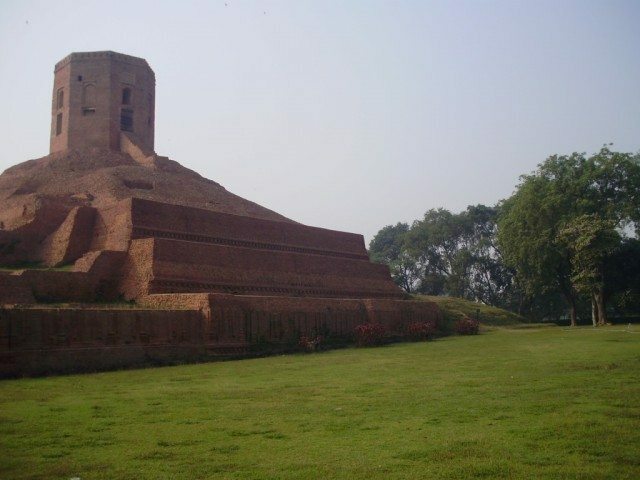 We started our walk and soon saw the first of the Sarnath monument, the Chaukhandi Stupa. A beautiful, well kept garden surrounding the Stupa welcomes you with dancing butterflies and chirping birds. 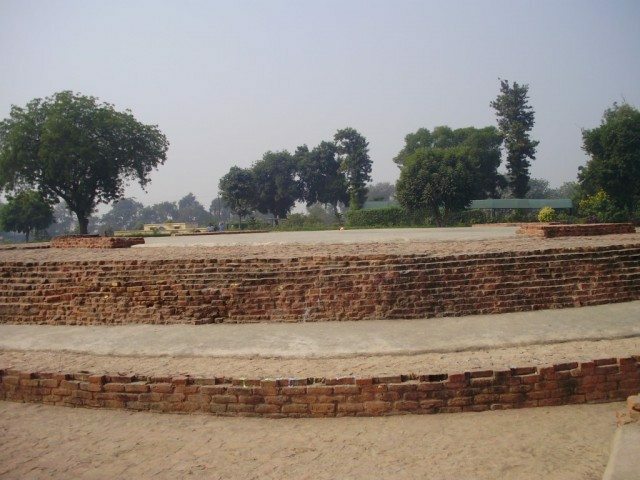 Chaukhandi Stupa has a square base. This stupa was built during Gupta times. And later during Islamic rule, it got the peculiar head with edges. Built in red bricks, it was an impressive site, standing tall under a blue sky, silently remembering the era by gone. This main road of Sarnath is lined with some beautiful Buddhist temples donated and built by several east Asian Buddhist nations. It really shows their affection and devotion towards Gautam Buddha and it’s land. Sarnath being one of the important centres of Buddhist learning and studies boasts an impressive array of important Stupas, Chaukhandi being one of them. The next one to come up was the Dharmarajika Stupa. It is a circular structure, which does not have the typical dome. The usual dome is now non existent, since it was pulled down in 18’th century. 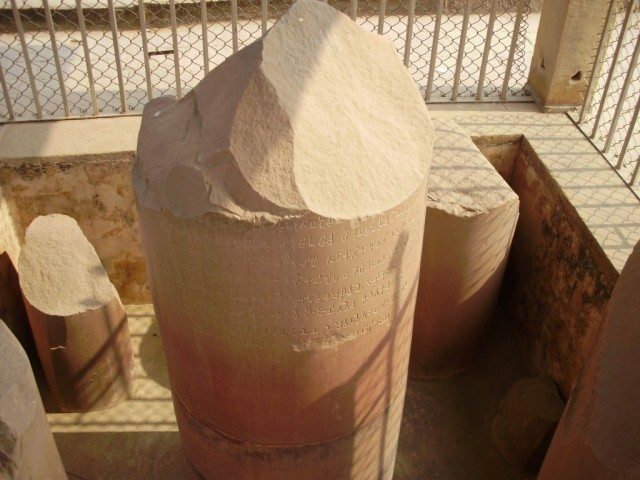 This stupa is supposed to have built by King Ashoka himself. Around this stupa there are several big and small votive stupa. A little ahead was an area known as Mulgandha Kuti. This is supposed to be the place where Gautam Budhha gave his first sermon to his first 5 disciples. Not only the humans but animals and birds also gathered around to listen to his words of wisdom. Moving ahead through a double line of votive stupa, you come across the massive Dhammekh Stupa. This is main attraction of the site. A solid 42 meter high Stupa was in ruins and shambles just a century and half before. 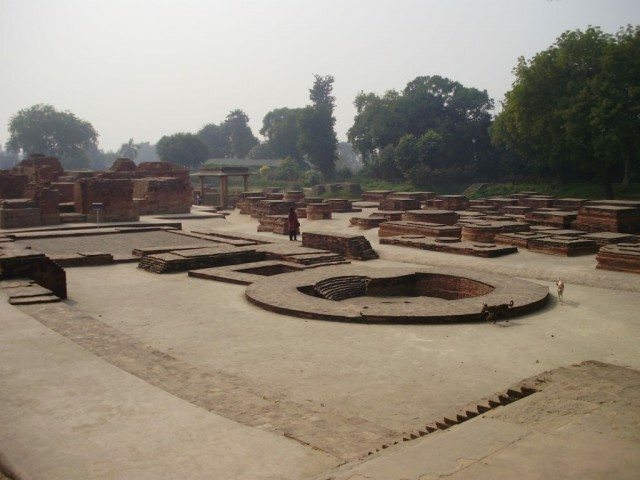 The Excavation at Sarnath gave a new lease of life to this structure. It was re-constructed wherever necessary, the surrounding cleaned up and now it is the prayer point from several Buddhists from outside and neo-Buddhists within India. All these stupa and other structures are in the same premise, where excavations un-earthed several important artefacts. These excavations started way back in early 19’th century. Sir Alexander Cunningham in his effort to trace the footsteps of Gautam Budhha, explored Sarnath with great interest. 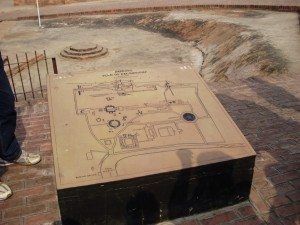 Mention of Stupa at Sarnath in Fa-Hien and Huan Tsang’s accounts gives the necessary credibility to this place from archeological perspective. 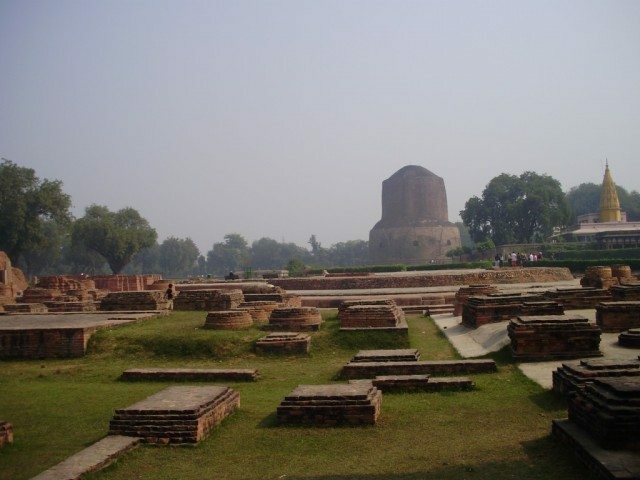 Sarnath museum is something everyone must visit. Not for the exquisite artifacts it houses, but more than that it is home to our national emblem. As soon as you enter, you are mesmerized by the beautiful and awe inspiring piece of Mauryan art, the pillar capital with 4 lions atop. Large sized and with the famous Mauryan polished finish, this symbol of sovereignty of Independent India really impresses. Below the standing four lions, on the sides of the spherical top of the pillar, exquisite carvings of four animals draw your attention. These are the elephant, horse, bull and lion which find importance in Buddhist scriptures, as guards of directions. The lions carved here are totally different than the lion carvings we see in some temples of southern India, particularly Mahabalipuram temples which have influence of Pallav art. The faces, the mane and body structure of these lions show Persian influence. There has been good influx of Greek and Persian sculptors during Mauryan era and that is evident in sculptures exhibiting Persian and Greek facial features and styles. Some of the prominent examples are the pillars in Karla caves. Or even the face of fasting Buddha which is a clear example of Gandhar art, has Greek features. 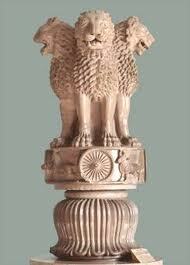 This lion capital was on a pillar, which still stands in the Stupa premise. It also has an inscription by King Ashoka on it. Visit to the Sarnath museum really made my day. Not only the four lions but just behind them, we also see the fragments of Ashok Chakra, one more of our national symbols. Surprisingly the original one has 32 spokes, whereas one which finds its place on our flag has 24 spokes. The last stop was the Mulagandha Kuti temple built by Mahabodhi Society not to be mistaken with the area of the same name which we visited earlier. It is quite a landmark in this small town and attracts visitors and devotees in hoard. This temple built with Shrilankan funds, has a very distinct architecture. In the same premise, a large Peepal tree, a memory of enlightenment welcomes you with all it’s leaves. There are new age sculptures of five disciples of Gautam Buddha under this tree. In side the main temple, one can marvel at exquisite paintings drawn by Japanese artist Kosetsu Nosu. With a feeling of peace and serenity, you walk out from the temple into the garden. The dusk has now set in. Sarnath stands still under the stars, gathering it’s centuries old memories from the bricks and ruins, the mesmerizing chant of बुध्दम शरणम गच्छामि, lingering on and on in the surroundings. Nice one Manisha and good shots too! Sarnath is definitely on my “places to travel to” list 2012. And dear admin I have a complaint. Please don’t ruin the posts by using adsense just below the title which most of the time interferes with photo or the first para. It is also very distracting and first time visitors might actually navigate away from the site instead of using the post. You have used so many adsense making site so heavy. I now monetizing is necessary but could you be considerate enough to please remove it from near the header near title. Great read Manisha. Though I have been to Sarnath but after reading your description, it seems that I missed too many things. We were with a small baby and it was extremely muggy during that day so probably we cut it short. @ Nikhil – Done. It was equally bothering me. If you would have noticed then those advts do not appear if you are logged in. Anway, they are gone now. Also, I would appreciate a direct email. I can assure you that it would be much more effective. Thank you Nandan. Sorry in future I’ll heed your counsel. After reading your article i came to know about these places. Thanks to you …………….. Thanks all for reading and liking the post! Enjoyed your post, Manisha. Had been there myself a couple of months back but I was not able to visit the stupas due to lack of time. Thanks for showing them.